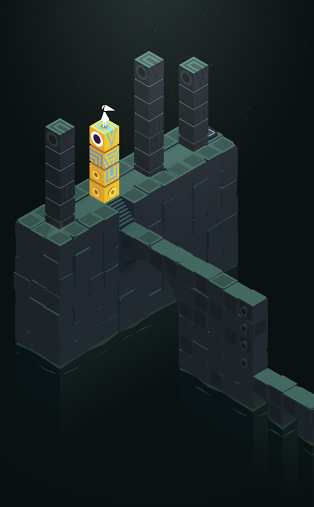 Monument Valley is one app I actually paid for - kind of. 710 has had it for months and he tried to tell me about it, but truth be told, sometimes all I hear is "Blah Blah Blah...Ginger". 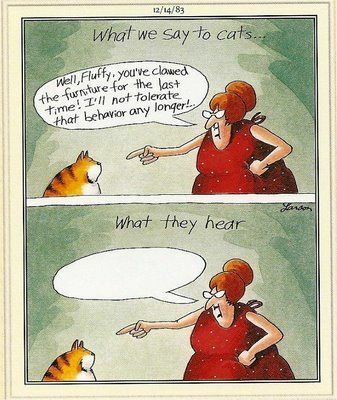 To be fair, sometimes he just hears the cat version of that. 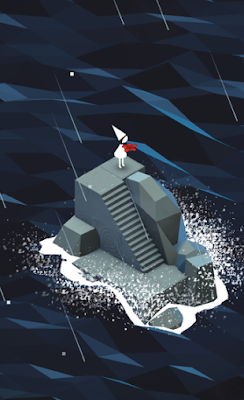 For a brief synopsis - a faceless girl with a pointed hat, Ida, goes through a series of mazes, staircases, doorways and ladders to reach certain places, and then to the next level. There are 10 levels in all for the initial version. 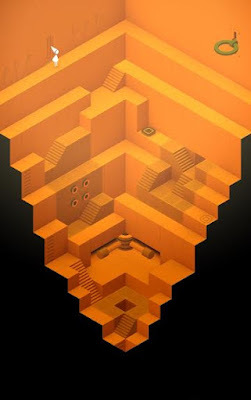 Some of the levels are very very M.C. Escher-esque. Not all are what they seem to be, as things lift, turn and morph depending on where you task Ida to go. And sometimes stairways move and connect like you're trying to get to your house at Hogwarts. There is a certain level of problem solving on your part to get from point A to point B. I would find myself on certain levels, just stymied and shutting it down, only to open a few hours later and just breeze through where I just was stranded. Some levels are easier than others, and not necessarily the beginning levels. Some are just frustrating. There are crows that scream at Ida, not allowing her to pass - and it is up to you to find a way. And along the way, she meets a friendly Totem. He (well, I'm assuming it's a 'he') only has one eye but it is very expressive. As much as a one-eyed Totem can be, of course. He doesn't always travel with Ida, and at times his lack of presence makes you a little sad. But Monument Valley's graphics are very good. 710 finds the music very soothing, and it is, but like most things on my phone, I have the sound off - but I see where he's coming from when I do have it on. And at the beginning of the post I seemingly contradict myself on paying for the app and getting it free via Starbucks. 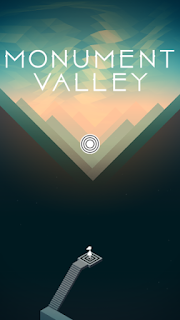 Indeed, I got Monument Valley for free. After the 10 levels, I got access to five more with "Ida's Adventure". But I finished those in just a little time. After that, you can access other levels, but it is for payment. $1.99. The original app also costs $1.99. Both costs are totally worth it. .....and you know I don't say that lightly. The app is my new obsession. It has taken time away from Words With Friends. Actually, I've gone through the levels a few times. I'm not sure what it says about my short-term memory, but some of the the levels I cannot for the life of me remember seeing some of it or how I got through it initially. Maybe it's like Angry Birds - when they update, sometimes they change some of the screens completely. Sounds interesting, I'll take a look. If I play one more hit of CupCake Mania I may throw myself off the top of this London bus.